What a delight to get to see this bird in a tree out from our breakfast window. I began taking photos but the windows have so many decals on them (so birds don't hit the window) that it's hard to get an empty space when you consider the window has grills in it also. So I wasn't happy with the photos I took, but salvaged a couple that weren't too bad. It's really rare to see one of these birds which inhabits woodlands with dense vegetation and is quite secretive. It's much easier to hear their song. Listen to this vocal recording. 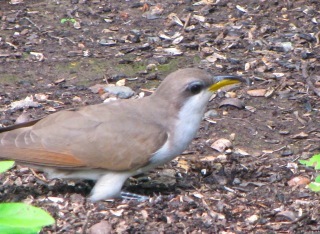 This bird waits for long periods motionless watching for prey to come by, and then they run and dash to catch the prey. They are common in southeastern United States, but populations are declining. They are rare in the West and listed as endangered in California due to destruction of the woodland habitat. Yellow-billed Cuckoo - "Praise the Lord, I Get to Live"
The first time I saw this bird was not a pleasant experience since it had hit the deck door because a hawk was chasing it. It died in my hands. Very sad with such a beautiful bird that I'd never seen before. One of the amazing things about this bird is that the entire period from egg to fledgling is a total of 17 days. Quite incredible! Within a week of hatching with shiny black skin with no down, the feathers of the young birds simply burst out of their sheaths, allowing the nestling to become fully feathered in about two hours. The word amazing seems to fit well with this bird. The diet consists of large insects, caterpillars, and some fruits and seeds. 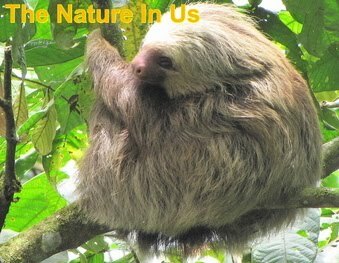 We have plenty of all of that here in our wildlife habitat. Right now there are fuzzy Buck Moth caterpillars all over the place. Both parents build the nest, incubate the 1 to 5 eggs, and brood the nestlings in equal proportions except at night the male rests on the nest alone. They incubate and brood equally during the day, but the male takes the night shift. It was a surprise to me to read that they sometimes lay an egg in another species nest. Sounds like the Cowbird, but at least they lay it in a nest where the birds are about the same size and appetite. 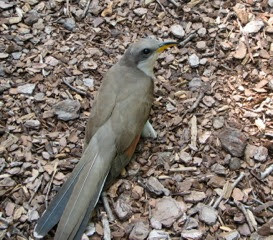 Yellow-billed Cuckoo - "Thank You, Ma'am"
It's been found that they have laid eggs in at least 11 different species, most commonly the Black-billed Cuckoo, but also in the nests of robins, wood thrush and catbirds. 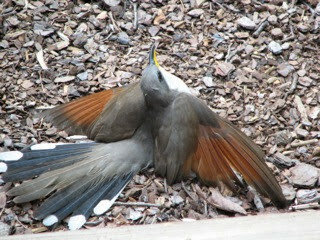 Seems the Yellow-billed Cuckoo receives a deposit from a Cowbird now and then, so maybe it's a nasty behavior learned from one of its peers. The second time I saw this bird a hawk again chased it into the deck door but it didn't hit as hard and flew back and landed on the ground. I immediately went out to protect any further attacks and was greeted with an amazing display. I instantly thought of the bird offering up praise to God for surviving the attack and for the "angel" who came out to be sure it had time to recuperate. Later the bird resumed a normal position on the ground and gave me a "thank you" and "see you later" look before flying off. 19 Years and No Pet Food Recalls!